"This book is a must for garden designers, entomologists, botanists, ecological restorationists, and others who are interested in this aspect of ecological science. It is a beautifully written and illustrated book on a timely but complex subject." "Heather Holm has two passions: native plants and their pollinators, and she’s combined these two loves into an incredibly informative and useful book that will help you choose the best plants for your wildlife garden to attract an abundance of native pollinators. She has effectively given us a botanical reference to native plants in conjunction with an entomological reference to native pollinators in one complete volume. ..."
“I am glad Heather Holm “slowed down” to observe the delicate relationships between native plants, pollinators and other beneficial insects. This book will inspire us to do the same, to experience the momement, with other living beings. This book is a wonderful tool to help us create, support and value these essential interactions in our gardens, communities, and region. I will refer to this guide book often." - Suzanne Dingwell, Author of Clean Green Natives blog. - Ellen Honeycutt, Author of Using Georgia Native Plants blog. "What I find truly unique about this book is that the author recognizes that a garden is an ecosystem. The gardener is a steward who works best when he or she understands how nature is working. So, Holm makes it known that not all pollinators are created equal. Most, in fact, are “flower visitors” in search of nectar. Those insects play other important roles, however, as predators, parasites, and parasitoids of pest and nuisance insects. The inclusion of those “other” bugs makes the book an invaluable resource all by itself." - Eric R. Eaton, Co-author of the Kaufman Field Guide to Insects of North America and author of the Bug Eric blog. "Pollinators of Native Plants fills a niche, whether used for planning a native plant garden or for guidance regarding what you are likely to see when in natural areas. There are plenty of excellent wildflower and insect guides, but few combine the two so conveniently as this does. A whole range of people will find Holm's book useful, from gardeners, organic farmers, and permaculturalists, to garden and landscape designers, as well as those restoring and managing natural areas. I could even see a role for it in the classroom. Beginners will find the book valuable because it is an entree to the kind of broad knowledge that takes years to develop, while experienced practitioners will find worthwhile information as well." - Adrian Ayres Fisher, Author of the Ecological Gardening blog. 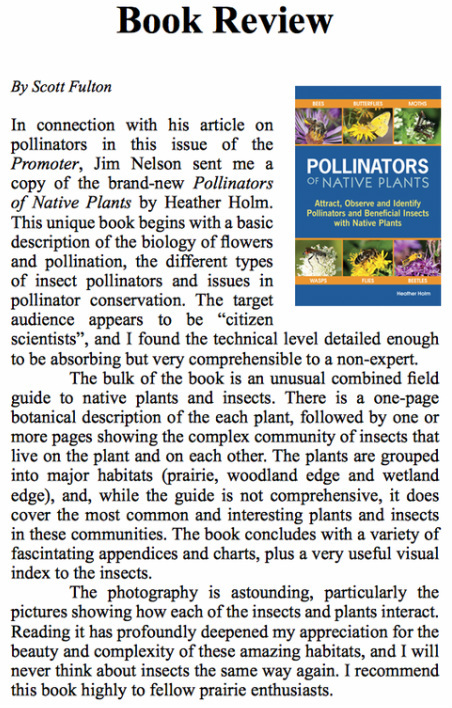 "A new book, Pollinators of Native Plants, by Heather Holm, sheds light on many of our native pollinators, and their interrelationships with native plants. Her book is an excellent companion toThe Xerces Society Guide: Attracting Native Pollinators. Holm delves much further into specific plant species and the specific insects which pollinate them." "The bulk of the book describes the best pollinator-attracting plants and the interactions between their flowers and the pollinating insects. Insect pollinators are fascinating. We can easily observe and identify them by watching the book’s featured flowers and examining their insect visitors. The excellent photographs in the book help us identify these bees, flies, and other insects. Then we can observe each insect’s strategy as it probes for nectar and/or collects pollen. We may see insect interactions like predation, copulation, and parasitization, too." “Pollinators of Native Plants” is nicely organized, well documented, and full of high quality, color photos (many taken by the author) of native plants and their pollinators and beneficial insect visitors. If you were not interested in, or aware of, native plants and their insect interactions before using this book, you will be hooked after you give it a try in the field." Book review from the Friends School Plant Sale, 2014 Catalog, p. 31. Book review from The Prairie Enthusiasts newsletter, Vol 27, No. 1 Spring 2014, p. 10. Minneapolis Star Tribune, Wednesday May 7, 2014. 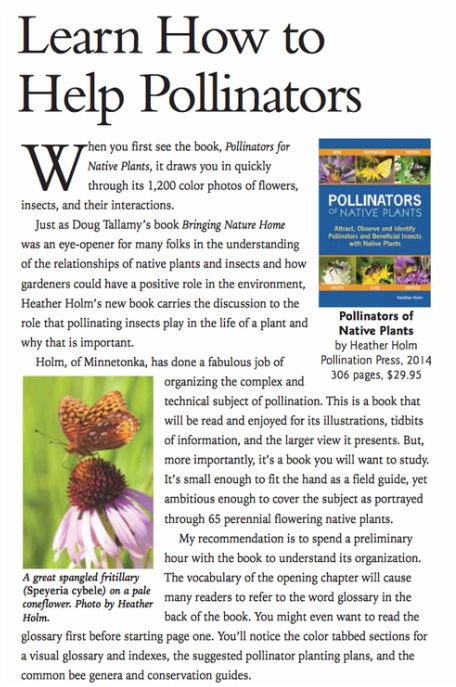 "A new book by Heather Holm, “Pollinators of Native Plants,” is an excellent resource with colorful photos cataloging dozens of Minnesota native plants and the pollinating insects they attract." 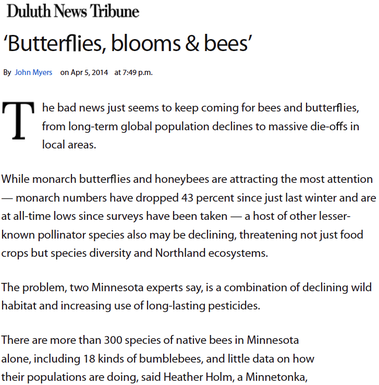 Duluth News Tribune article, Sunday April 5, 2014. This remarkable guide is the result of years of intense observation, research, and documentation of the interactions between native pollinators and native plants. It contains extraordinary and fascinating detailed facts yet is a very easy to use guide. 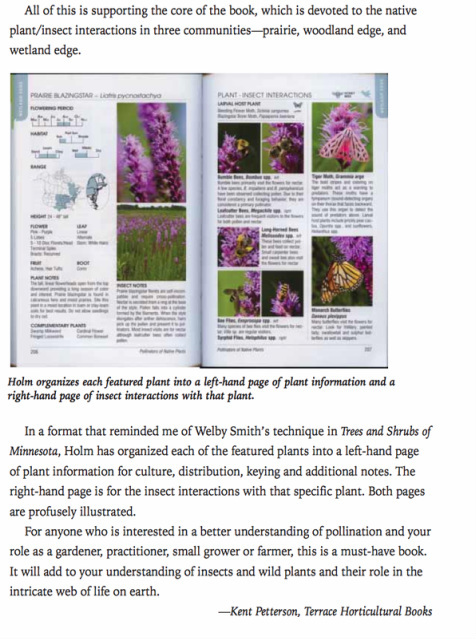 The main body of the book provides native plant-insect interaction descriptions for landscapes of the prairie, woodland edge and wetland edge. Info given on plants includes flowering period, habitat, geographical range, plant characteristics with interesting accompanying notes. Details of insect visitors to each plant includes how and when nectar and/or pollen is gathered and transported to the young. Photos of the plants, insects and the sequence of the interactions are provided. The author also includes suggested landscape plans for various locations, many charts, visual glossaries of plant parts, bees, and a visual index of various insects. Her discussions explaining the pollination process, types of pollinators, and needed conservation measures are clear and enlightening. I highly recommend this guide to read and reference frequently. 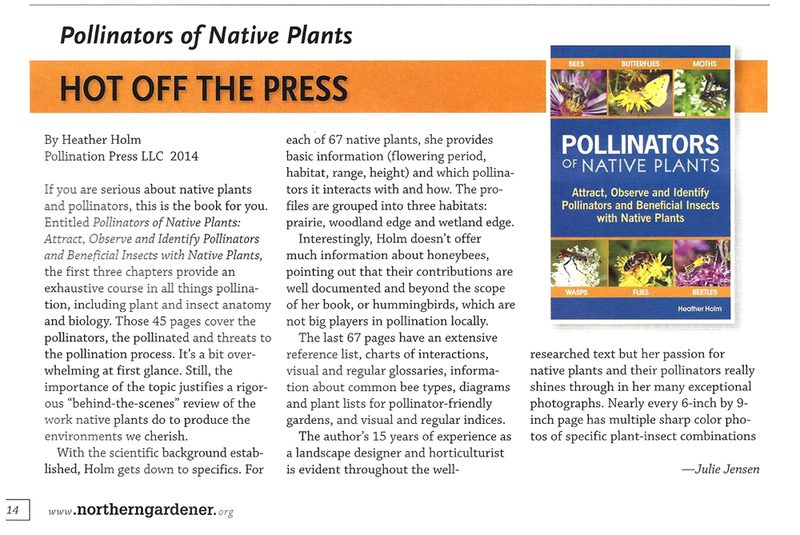 Book review from the Minnesota State Horticultural Society Northern Gardener Magazine, March/April 2014, Volume 142, Number 2, p. 14.